I don't know if it's just me, but the thought of drunken anything-edible is pretty dang appealing. Just imagine - *insert your ingredient of choice here* soaking in the fruit of the vine and wallowing in it's goodness. Culminating in you eating up all that goodness of course. Yeah, I knew you'd come round to my point of view eventually. Needless to say, when I saw this recipe I couldn't resist. And, since I still have a serene (and not at all un-goofy) smile on my face after stuffing my face with these figs I will keep this post short and sweet. So you can get into the kitchen and start dunking things in wine too. Accompanied by a glass of wine to dunk yourself in drink. Just don't blame me for your actions while under the influence of these wine-y jammy figs. 1. Add figs and 1 1/2 cup of wine to a saucepan, bring to a boil, then cover and allow to simmer for 1 hour. Check from time to time to make sure figs aren't sticking to the pan and add some water if necessary. 2. Meanwhile, heat butter in a frying pan and brown the chicken fillets on all sides, adding salt to taste while you do so. 3. Add chicken to the figs, along with the extra water (if all the liquid has been absorbed), orange marmalade, lemon juice and mint. Cover and allow to simmer for another 10 - 15 minutes or until the chicken is cooked through. At this point you may wish to remove the chicken from the pan and cook the sauce on high heat (you can leave the figs in) until reduced. Or you could just serve it as is, alongside some boiled and buttered garlicky baby potatoes. I wrote a whole post not so long ago on how much more appealing foods are when combined with alcohol. And this is just another prime example. I love figs and inhale them as is. Dunked in wine - dangerous. what a great chicken dish!! the figs are a perfect compliment to the chicken and using alcohol always helps!! Chef Dennis - You're right, the figs complemented the chicken very well. Nina - :-) Your family not big on fruit with their meat? You're most welcome here! Sounds delish! Wish I could try this out some time soon! This looks so refreshingly different and tasty. Do you reckon it would work with fresh figs too? what a beautiful colourful foto! and the chicken looks so tasty. drunken certainly exudes something sinful and yummy. :) tq for dropping by. 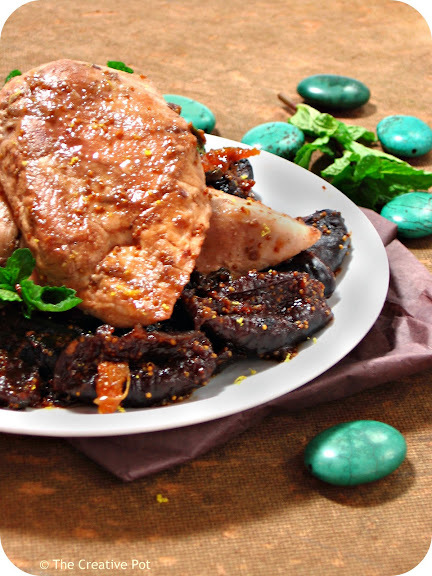 You had me at drunken figs, this looks so savory! It's not easy to make chicken look this good. Saying drunken figs when you drunken too much is almost as much fun as this dish. Lovely flavours and textures. yummy!! Claudz - Do try it, you won't be disappointed. Val - Yes, I'm sure fresh figs would work swimmingly, perhaps you'll just need to reduce the liquid in the recipe to avoid making fig soup. Alternatively you can increase the cooking time to allow the figs to allow the liquid to condense and evaporate. Zurin - Thank you and thanks for visiting; it's lovely to see you! Valerie - Chicken is a tricky beast, I agree. But TheHusband loves it, so I tend to make it quite frequently. Rose - Can imagine yes! Will try that out next time I have it. I love the idea of serving this with figs! Anything dunked or infused with alcohol MUST be good! Although, I've yet to eat a fig that way! This looks really good! This sounds yummy, and I agree that anything cooked in _____ (insert alcohol of choice here) is always much more yummy!